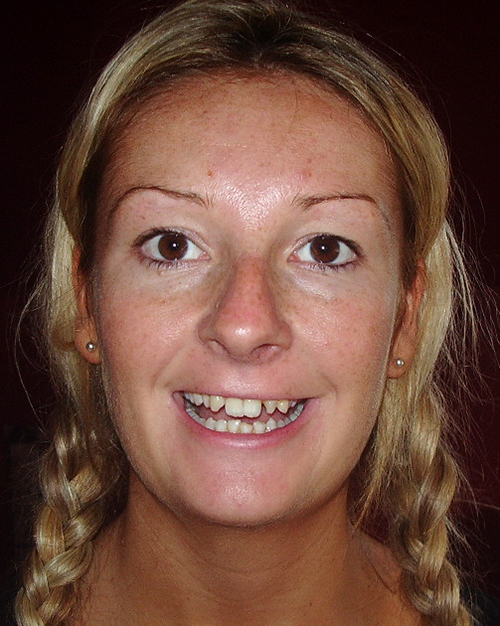 Emma’s dental problems started as a child when many of her adult teeth failed to grow. 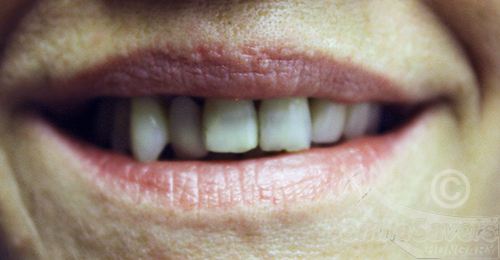 She was left with baby teeth that were out of proportion with her adult face and were also crooked. 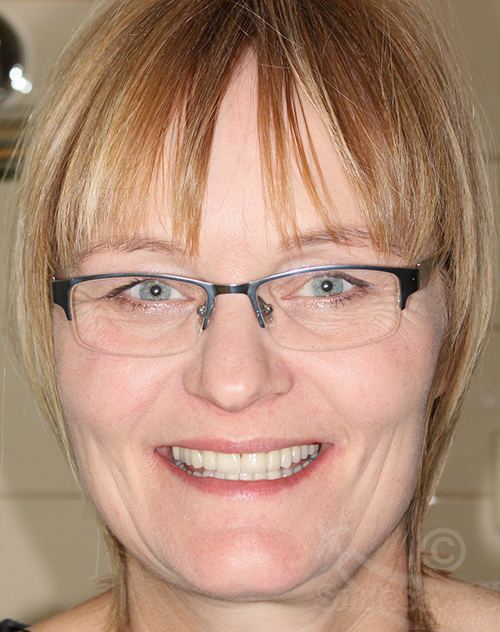 Her new smile was achieved with a combination of dental bridges and crowns. Emma was very happy with her new smile and was featured in her local newspaper. Meeting patient’s expectations is my ultimate goal in my work. To achieve excellent results in dental care, I find professional skills and positive patient-dentist relationship based on mutual trust and understanding important. 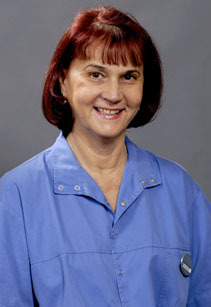 Christine was suffering from gum disease, which her sister Teresa was also suffering from. They traveled to Budapest together. Her full mouth rehabilitation took 9 months to complete and Christine was over the moon with the final results. 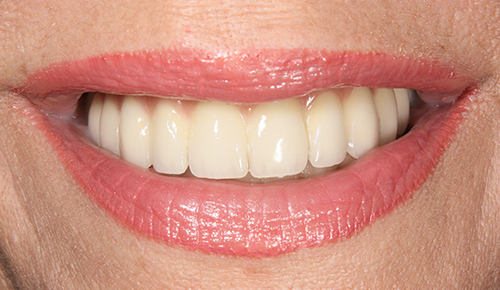 Christine’s treatment took 9 months to completed, but in the end the final results were aesthetically pleasing and fully functional. Time Required to Completed Treatment:Three visits were necessary, the 1st was for 3 working days, 3 months later the 2nd for 2 days and after a further 6 months healing the final visit required 8 working days. I feel blessed, for my profession is my hobby, my avocation. 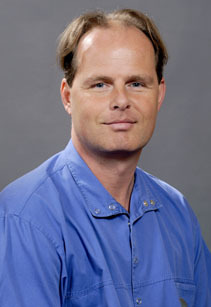 I am passionate about my work with which I can make people’s life happier and more complete. I constantly strive to follow the highest professional and ethical standards to ensure my patients have a functional, healthy, and aesthetic smile throughout their lifetime. 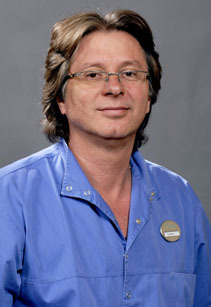 As the manager of the Implantcenter dentistry, I offer comprehensive dental and oral surgical care utilizing the latest advancements in dentistry and implantology. 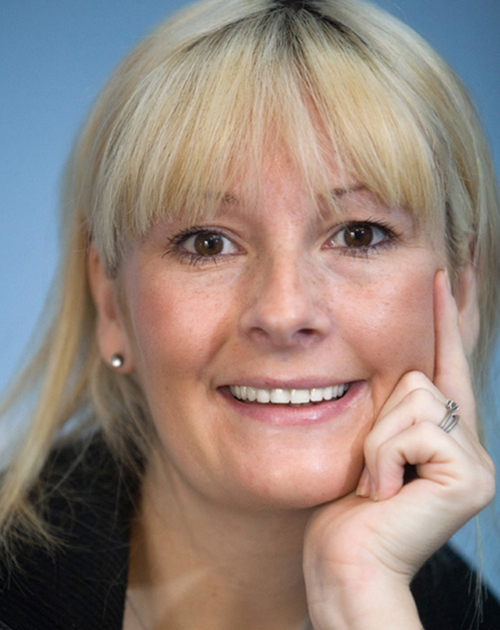 My staff and I share a commitment to providing high-quality dental care in a friendly and relaxed atmosphere. 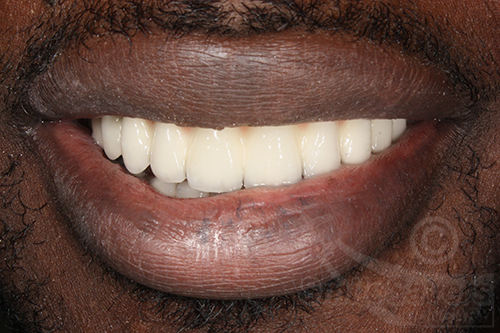 Our client’s front teeth had gaps, they were out of alignment, discoloured and angulated. 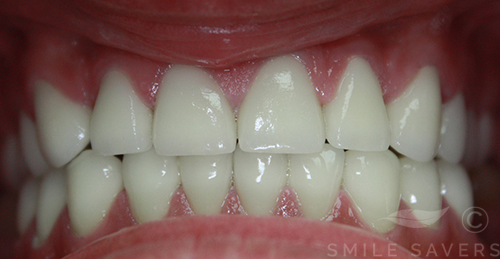 A fuller, more even and brighter smile was achieved with metal free zirconium crowns and Zoom whitening. 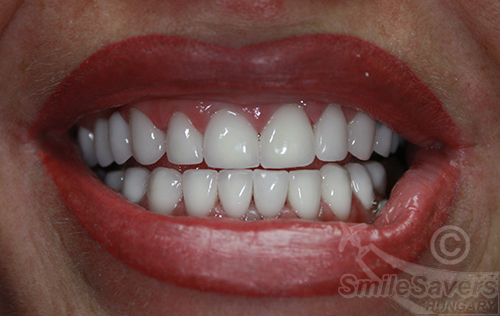 Our client wanted to achieve a more aesthetic, fuller and brighter smile, she traveled to Budapest for 5 days and received a full transformation. After suffering with gum diseases for years, Teresa and her sister Christine travelled to Budapest for extensive dental work. 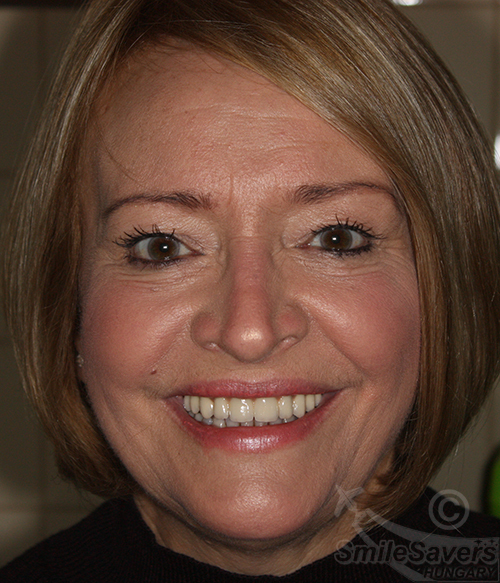 Teresa was suffering from a periodontal disease, the teeth were loose, uneven and there was significant bone loss. After the physical assessment in London, the dentists have confirmed that only 5 of the teeth were strong enough to keep. After the treatment her smile line perfectly complements her face and appears natural, symmetrical and aesthetically pleasing. Time Required to Completed Treatment:3 visits were necessary to complete the treatment, one for 3 working days, 3 months later one for 2 working days and the final visit required 8 working days. 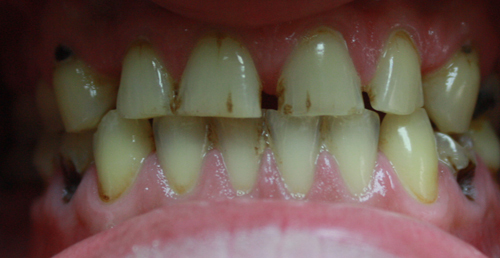 Our patient came to us with broken, missing and discoloured teeth and had extensive wear and tear. Several implants were used in the molar and premolar area to replace the teeth and to provide sufficient chewing surfaces. 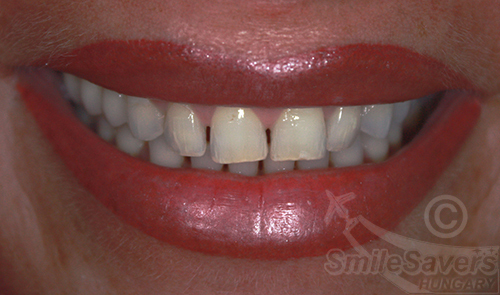 The front teeth were restored with metal free zirconium crowns to provide a natural result. Amanda was absolutely delighted with the results of her new smile. I knew if I only went for half the treatment the whole jaw wouldn’t perform 100% and make my existing wobbly teeth worse, so sensibly I went for the full monty! Time Required to Completed Treatment:1 appointment in London for an extraction. then 3 months later the 1st visit to Budapest required 3 days and 4 months later the 2nd visit required 7 working days. David Naughton grew up hating his teeth. 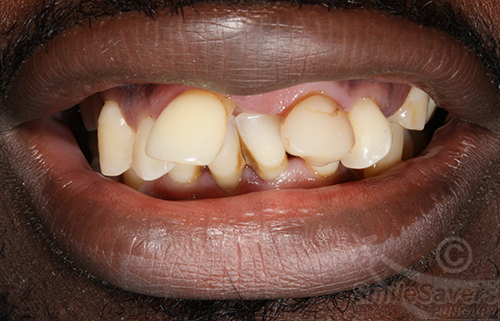 They were gappy and decayed and as he got older, his dislike of his teeth meant that he failed to look after them properly. His problems worsened. David felt let down by his NHS dentist, who didn’t offer the treatment that was really needed. 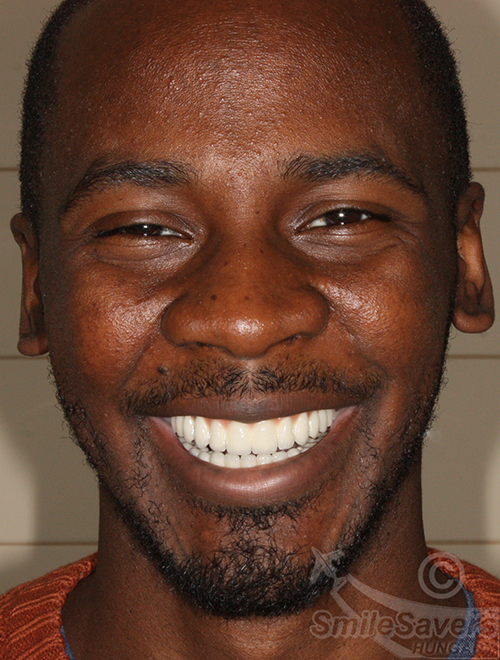 David’s teeth were restored with metal free zirconium crowns and dental implants. Time Required to Completed Treatment:7 working days and 5 working days 3 months later. My Life is my Work, my Work has been my Life for some decades now, and what keeps it alive is the trust and love I receive from my patients day by day. 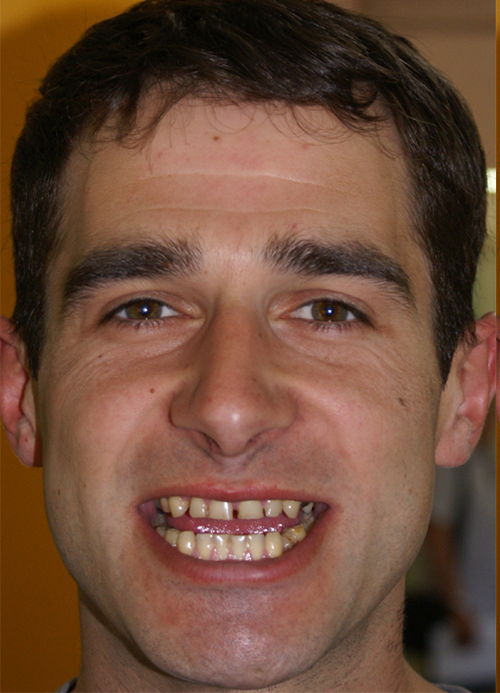 Our client client prior to his treatment in Budapest was suffering from periodontal disease, the teeth were mobile and misaligned and the bite has collapsed. 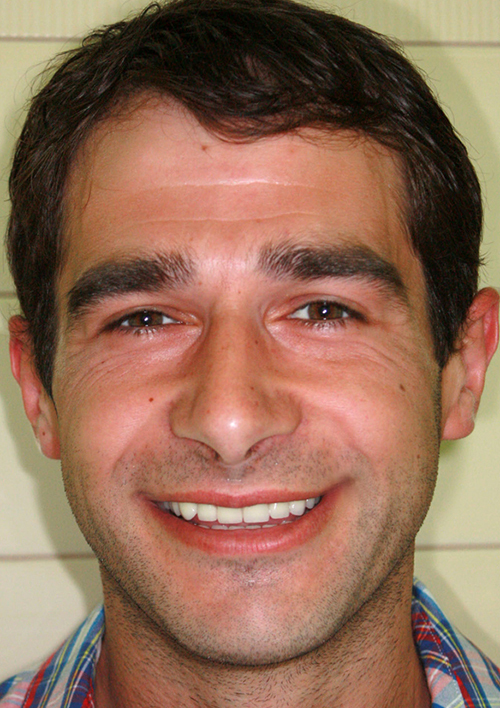 A full rehabilitation was achieved with extractions, bone grafts, upper and lower implants and fixed porcelain bridges. 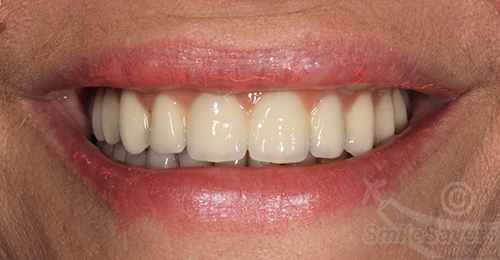 Pink porcelain was added to the bridges to achieve an even gum-line and symmetrical smile. The client was extremely pleased with the results and also enjoyed his visits to Budapest.